With the second season of Marvel’s Luke Cage set to premiere on June 22nd, and since we didn’t do an episode-by-episode review of the first season when it ran, I figured this would be a good time to re-watch the series and do recaps and reviews so folks who don’t have time can do a quick catch-up. This article contains spoilers for Marvel’s Luke Cage season 1, episode 1, ‘Moment of Truth’. One of the nice things in these series is the comic creators get credits upfront. “Based on the Marvel Comics by Archie Goodwin, George Tuska, Roy Thomas, and John Romita.” And the opening credits / theme kind of has a mix of ’70s and modern going for it. A ’70s twangy guitar with a more modern baseline. All the episode titles are based on songs by Gang Starr. The episode opens in Pop’s barber shop with Pop (Frankie Faison) talking about the New York Knicks and swearing, which has him putting money in the swear jar. We see that Luke (Mike Colter) is working there sweeping up and has to deal with a loudmouth customer. A woman comes in and flirts with Luke, talking about how they should get some coffee sometime. This leads into a quiet scene between Luke and Pop and we learn that Pop knew Reva, Luke’s deceased wife. Pops tries to get Luke to get his life going again, dropping the line “always forward, never back.” He also calls him “Power Man”, a nice nod to the comics. Luke then sees Chico leave the shop with a gun. On his way to his second job, he gets hit up for the rent by his landlord Connie, who also owns a Chinese restaurant. We move over to the club, Harlem’s Paradise, where we first meet Cornell “Cottonmouth” Stokes (Mahershala Ali) and Mariah Dillard (Alfre Woodard). Luke works as a dishwasher but is asked to fill in as a bartender. 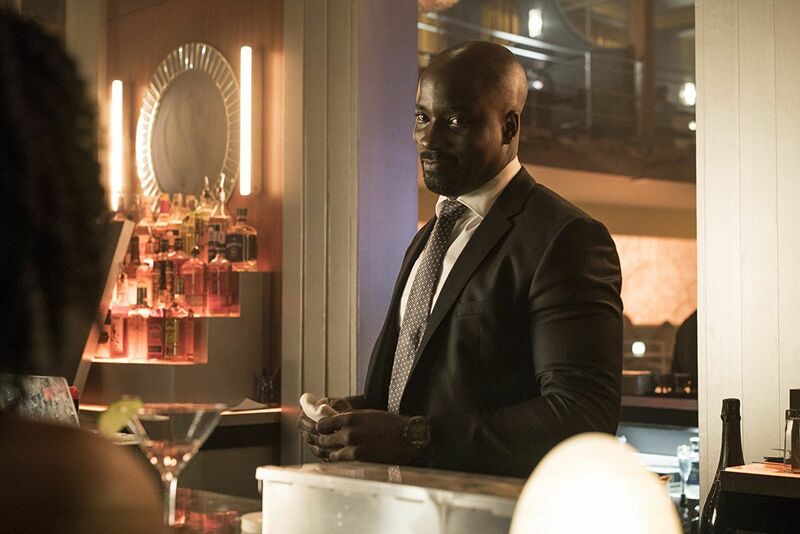 One of the folks Luke gets to make a drink for is Misty Knight (Simone Missick), who’s in the club keeping an eye on Cottonmouth. He’s working a deal with Domingo Colon (Jacob Vargas) to sell 10 cases of Justin Hammer made guns at a $100,000 a case. But the sale, taking place elsewhere, gets screwed up when Chico, Dante, and Shameek come in with guns blazing, killing everyone and take the money. Shameek then shoots Dante because Cottonmouth would know it was an inside job. Luke delivers champagne to Cottonmouth, who offers him a job if he is willing to carry a gun. Luke passes. Then Dante calls one of Cottonmouth’s men and lets him know things went south. Outside the club, Luke runs into Misty. They have a flirty banter and she asks him to coffee… which neither of them drink. This leads to them going back to his place and “not drinking coffee” intensely. In his sleep he dreams of being beaten in prison, and Misty tells him he said the names Shades and Comanche. She then gets called into work and lies, telling him she’s an auditor. We then go to the crime scene where her partner, Detective Rafael Scarfe (Frank Whaley), is already working the case. We cut back to Cottonmouth, who tries to smooth things over with Domingo to no avail. Then Hernan “Shades” Alvarez (Theo Rossi) arrives, sent by “Diamondback” to help Cottonmouth get back on track. The guns are in police lockup and the money is in the wind. It’s obvious that Shades and Cottonmouth have a past, and Shades assures him that it’s not a takeover; Diamondback wants him to succeed. Pop is upset; Dante was one of the kids who used to work for him, and now he’s dead. Pops is sure that it was Shameek and Chico with him; they were also his boys. Meanwhile Mariah is doing a press event to help Harlem when Cottonmouth and Shades show up. We find out that Mariah used federal and taxpayer money to fund Cornell’s club and she needs the money back — money he was supposed to get through the gun sales. Now she needs it or faces an audit, which could lead to jail time. He promises to get it for her. They also know that it was Shameek and Chico that hit them. They find Shameek and bring him to the club where Luke sees him. Luke is about to go and try to help when he sees Shades and recognizes him from Seagate Prison. Cottonmouth starts to interrogate Shameek to find out where Chico is, but when Shameek spits blood on him, Cottonmouth beats the kid to death with his bare hands. Luke is freaked out because of Shades. He’s ready to leave town but realizes that he wasn’t recognized. We see Luke has a bunch of books, which leads into a flashback of him meeting Reva (Parisa Fitz-Henley) for the first time in prison. The episode is a great setup for a series. We get to meet almost all the important players, get a good handle on what makes the bad guy tick, and see the hero go from hiding out to protector. As Pop says, “always forward”, and that’s what this episode does. It also establishes a few things that become key to the series. I remember liking it a lot on first view. It got me to jump immediately into the next one, but I see so much more now on a second viewing. The scene with Cottomouth talking to Shameek about his Biggie picture and how everyone wants to be the king really gives you a good feel for the character, mixed in with the scenes of him playing the keyboard and talking with Mariah. He’s a complex character, and that is what makes the Netflix series good. Some of the best villains in the MCU are in the Netflix series. We also get to see Luke’s struggle between the man he is and the man he has to be because he’s on the run. We see that change as the episode goes on to where he’s ready to be the hero by the end. He may not ever suit up like Daredevil, but the pulling up the hoodie at the end of the episode was his moment of accepting who he is.